Nothing but the road shines under the sun. 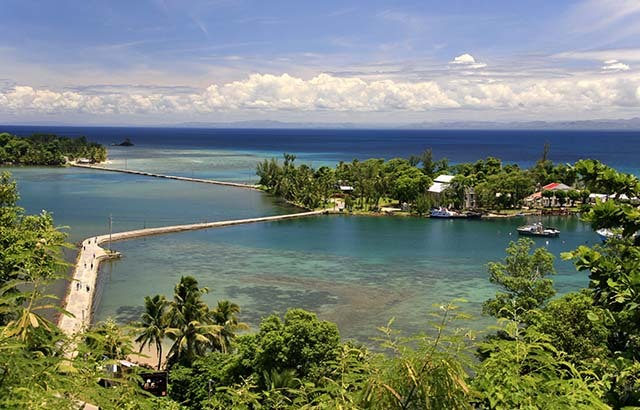 Two or three climbs that you sometimes require them to dismount if you are cycling, but a pleasant walk ; along creeks beachfront you through charming villages. Their inhabitants will offer to cinnamon or green pepper, some women can make you be doing you hair in braids or you dress pareos. Arrival on the beach of Coconut for a swim on a sandy beach before returning to the hotel. Departure 7:30. 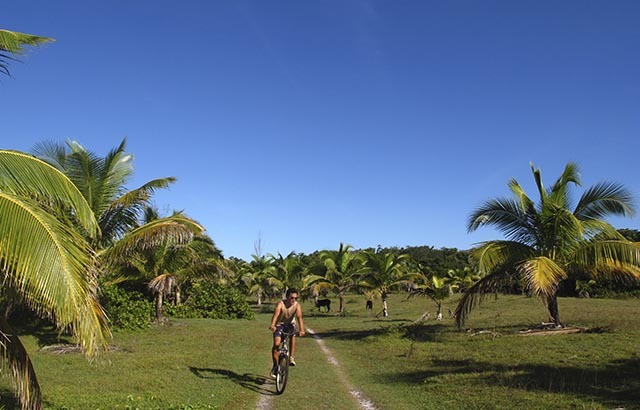 A Tour Anivorano south to Ile aux mats : the whole day to explore this small island in its entirety, stopping the passage a little time Ambodifotatra, the chief town of Sainte Marie. After crossing a small canoe, Walking around the island to Mats : lemurs free, extremely rare purple orchids and beautiful beaches. A short walk takes you to a lagoon which makes the color of the turquoise sea as a postcard, and a swim at the southern tip of the island in a lagoon before extraordinary picnic or enjoy a meal. In 4×4, you "get" in town, à Ambodifotatra. After a visit to the vegetable market, craft shops, you will discover the oldest Catholic churches in Madagascar, all dressed in white and red. You will continue this historic journey to the island across the bay pirates Pirates canoe, mangroves quand au milieu de la mer est haute. From 1685, pirates, forbans, flibustes and other buccaneers are a protected landmark. They attack ships from India and make Sainte-Marie island all pirates. Big names rub shoulders piracy so this island such as French Plentain, la Buse, American Thomas Tew and especially the English Thomas White seems, almost undoubtedly, the father of the first king of the island betsimisaraka, which bear thereafter Queen Bety, the most famous queen of Sainte-Marie. The cemetery pirates piously preserved the memory of the ancestors of the sea pirates who had their kingdom. This ballad ends with a picnic on the beaches of South, or a meal in many hotels and restaurants in the south. Duration : Day ; ATV for trained cyclists. 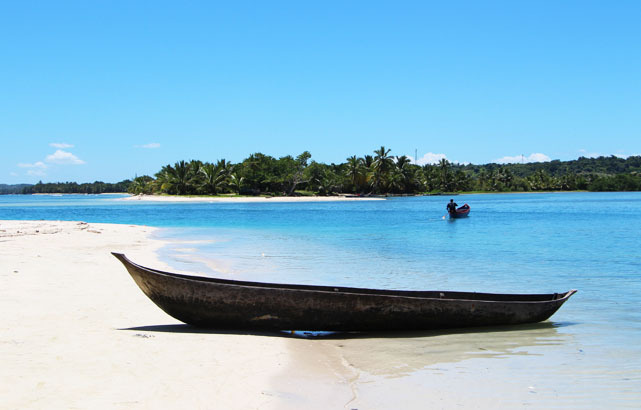 By a through track from west to east with varied landscapes, you reach the large village center island, Sahasifra, recognizable by a white sculpture in the shape of Madagascar at the entrance of the village. After bifurcated at this location, you arrive after a leafy path and a beautiful coconut grove on Clipper Bay, stretched on 5 kms of sand along a lagoon paradise. De là, after a swim in the Indian Ocean and possibly a turquoise green fishing "tek tek", you leave to Sahasifra, then the village of Anafiafa and restaurant Louise, Paradise Ampanihy. Louise you cook crab mangrove and coconut sauce chicken to perfection. Before or after meals, Promenade in pirogue, in the mangroves of the Bay Ampanihy, bras ce mi-mer, mi-rivière, where shrimp abound between the roots of palétuviers.Sur the way back, a lovely swimming awaits you, in freshwater waterfall Ankiriry. Foaming in green chromes, blue, white and gray ! 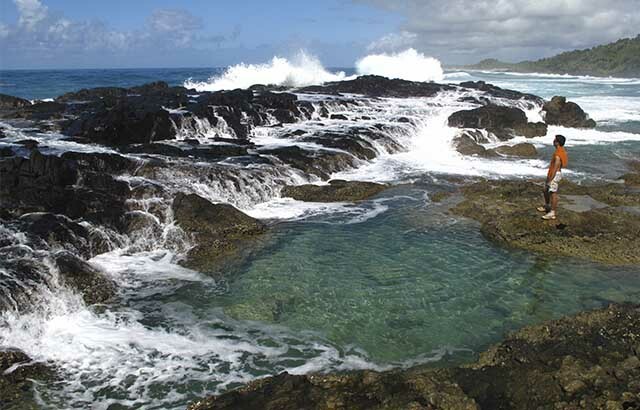 Natural pools are near the village of Ambodirano you pick the look, at the northern tip of St. Mary, at the end of a beautiful red clay track. Le fady (prohibited) this sacred place, put your feet in the water with his shoes but once removed, you can throw coins in a despiscines to make a wish, or swim along the immense beaches protected by a granite barrier. A diner on the beach, Chez Emile, serves one of the best lobster on the island, facing the ocean swells. After the meal, a walk of half an hour takes you to the beautiful view of the beach of the East ... 15 km of sanding !